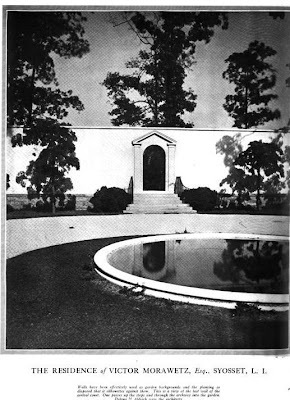 'Three Ponds', the Victor Morawetz estate designed by Delano & Aldrich c. 1912 in Woodbury. Morawetz was an attorney with Seward, Guthrie, Morawetz and Steele. Today the house is part of the Town of Oyster Bay Golf Course. Click HERE to see 'Three Ponds' on google earth. 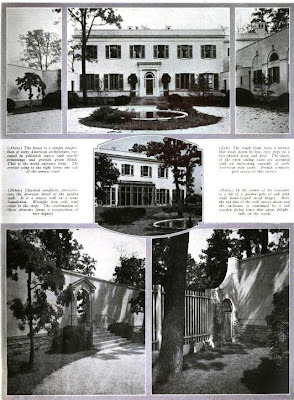 Pictures from House and Garden, 1918. Very nice work on this website. Please keep up the history. I grew up in a house very similar to "Three Ponds" in Wilmington, DE, built in 1929. I'd love to be able to see these photos enlarged. I grew up across the street from Three Ponds. Shortly after we moved in in 1965 the swimming pool was sold off to the new house being built next door as it fit more properly in that back yard than on the side of the house where it was originally placed. Only the left side wall (facing the front) was left standing. The back of the house looked out onto the court of the street created for the new houses being built. Three Ponds was left with virtually no backyard. Today the new owners reversed the entire house. The front grand entrance has been closed off and the new entrance is on the back side of the house. The long driveway in the front has been demolished and replaced with grass. Fortunately the house still stands mostly intact.